I have wanted to do a pictorial quilt of our beautiful Ottawa Valley for many years and have spent a lot of time wrestling with what I wanted to share. The landscape? The architecture? The culture? 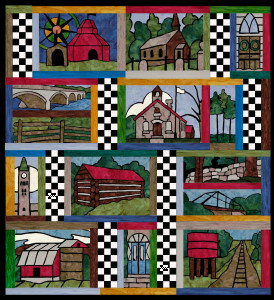 There may be many more “valley” quilts to come, but for now I thought I would try to represent some of our heritage. The landmarks or representations selected for this design reflect what I feel this special place is built on- community, faith and the land. 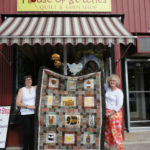 I also wanted to take the theme and expand it for a celebration of the valley and our amazing network of quilt shops. We are truly fortunate to have so many and such a variety of shops close to hand-let’s keep supporting them! Thus the “Edge of 17” Shop Hop was created. Hoppers can collect the blocks and use them in the full quilt, but we are also offering something a little different. Each block can stand alone in a specially designed project. From gift bags to hobo bags to aprons, there are eight projects to collect-make one, make them all, make the quilt-the choice is yours! I will be posting about the design process as well as sharing some of the stories behind the blocks and the shops that will feature them; all this leading up to the Edge of 17 Shop Hop on June 10-13.